Google Analytics can be complicated and in-depth, so I will be covering a few important aspects of it over the next several weeks. Google Analytics is a powerful tool to help you figure out what is working and what isn’t on your website and ad campaigns. It doesn’t usually come built-in with a website though, but if you have a Virtual Vision website, then you have it. See visitors to your site in real time, or in the past. You can compare results for different time periods. Find out where your visitors are from. You can target them for an ad later. See what is your most and least popular content. 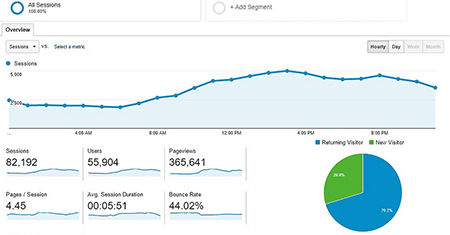 See how many visitors you had to each web page, how long they stayed, and where they went next. Find out how they got to your site. Suppose You Tube brought a lot of visitors to your site, you would concentrate your efforts there to keep the momentum going. Next step: Check your analytics overview, gather your log in information and get ready for more information on how to use it to your advantage.